The guitar brand name "Goya" existed from the mid 1950's to 1996. Nylon and steel string acoustic and acoustic/electric guitars, hollow body electric guitars, solidbody electric guitars and basses, thinline electric archtops guitars, banjos, mandolins and amplifiers. The Goya brand name was initially used by Hershman Musical Instrument Company of New York City, New York, in mid 1950's for acoustic guitars made in Sweden by Levin, particularly known for its classical guitars. NOTE: As best I can tell, "Goya" brand guitars were made starting in 1954 and ending in 1996. The Goya brand name was initially used by the Hershman Musical Instrument Company of New York (Goya Guitars Inc.). The "Goya" name comes from Francisco Jose de Goya, the famous 18th century Spanish painter known as the father of modern art (Francisco drew a lot of Spanish guitar players too). The distribution for Goya guitars went from Hershman to Kustom Electronics Inc. in 1970 and then over to Dude Inc. (both of Chanute, Kansas) in late 1972 as best I can tell. Most of the acoustic guitars during this perion (1954-1973) were handmade in Sweden by the Levin company (I believe the possible exceptions were the G-50 models made in the USA based on descriptions in some of my Goya catalogs). The Goya brand then went to Martin Guitars in 1974 (the same year they acquired Levin) and lasted until 1996. These Goya guitars were made in Japan, Korea and Taiwan (I've never seen a Martin "Goya" that said made in Sweden). Sparkle plastic covered Model 80 (ESP24 Standard) and Model 90 (EDP46) hollowbody electric "Les Pauls" (with replaceable pickup assemblies) - made by Hagstrom - introduced mid 1959. These are relatively rare. By 1963 company had become Goya Musical Instrument Corporation, marketing primarily Goya acoustic guitars. Goya purchased by Avnet, Inc., prior to 1966, when Avnet purchased Guild Guitars. Probably some 1970's guitars were made in Japan. Brand name purchased by C.F.Martin in late '70s with Japanese-made acoustic guitars, solidbody electric guitars, basses, banjos and mandolins imported in around 1978 and continuing through the 1980's. Brand name was then used on high-quality Korean-made acoustic and acoustic/electric guitars, banjos and mandolins. Brand name "Goya" discontinued in 1996. Goya instruments were originally produced in Sweden by the Levin Company that has been making guitars since the 1900's. Distributed by Hershman Musical Instruments Company of New York. Later Goya instruments were built in Korea from the early 1970's to 1996, and were distributed by the Martin Guitar Company, located in Nazareth, Pennsylvania. The Goya trademark was originally used by the Hershman Musical Instrument Company of New York City, New York in the 1950's on models built by Sweden's Levin Company (similiar models were sold in Europe under the company's Levin trademark). Levin built high quality acoustic flattop, classical, and archtop guitars as well as mandolins. A large number of rebranded Goya instruments were imported to the U.S. market. As a side note - Anders Was�n of Gothenburg, Sweden (where Levin/Goya was made) provides this additional information: H.C. Levin was from Sweden and as I was told worked in the United States as a trainee at the Martin Guitar Company. So did his son just before World War I (as he told me himself). H.C. went back to Sweden and formed the Levin Guitar company (Goya in the US). In the late 1950's, solidbody electric guitars and basses built by Hagstrom (also a Swedish company) were rebranded Goya and distributed in the U.S. as well. In 1963 the company changed its name to the Goya Musical Instrument Corporation. Goya was purchased by Avnet in 1966, and continued to import instruments such as the Rangemaster in 1967. By the late 1960's, electric solidbody guitars and basses were then being built in Italy by the EKO company. Avnet then sold the Goya trademark to Kustom Electronics. It has been estimated that the later Goya instruments of the 1970's were built in Japan. The C.F. Martin company later acquired the Levin company, and bought the rights to the Goya trademark from a company named Dude, Inc. in 1976. Martin imported a number guitar, mandolin, and banjo string instruments from the 1970's through to 1996. While this trademark is currently discontinued, the rights to the name are still held by the Martin Guitar company. The Goya company featured a number of innovations that most people are not aware of. Goya was the first classic guitar line to put the trademark name on the headstock, and also created the ball end classic guitar string. Levin-Era Goya models feature interior paper label with the Goya trademark in a cursive style, and designated "Made by A.B. Herman Carlson Levin - Gothenburg Sweden." Model and serial number appear on the label, as well as on the neck block. Albin Hagstrom's company produced guitars in Sweden from 1957 through the early 1980's. Early distributors included the Hershman Musical Instrument Company of New York (under Goya logo) and Selmer, U.K. (under Futurama logo). Hagstrom really came into it's stride during the beat boom of the early 1960's, making functional, affordable models such as the Kent. Hagstrom also began to export widely, often badging guitars to suit the marketing brands of the customer. Thus some US Goya-brand guitars orginated at the Hagstrom plant, as did a number of British Futurama models.. The earliest known Goya guitars that I can VERIFY are from 1958. I have a 1958 Goya Guitar catalog to base that statement on. Also, all Goya guitars with labels saying "Made by A.B. Herman Carlson Levin, Gothenburg, Sweden" have serial numbers showing a 1958 date using the "Locksley Serial Number List." I believe that list can be ONLY be used for Goya guitars having that label. All other Goya guitars CAN NOT use the "Locksley Serial Number List." Goya guitars were imported from Sweden by Kustom Electronics in the late 60's to early 70's. I have a "Kustom Goya Ad" dated 1971. I've been told that Kustom didn't put serial numbers on the Goya guitars. The Goya distributorship was then sold to Keith Dodd of Dude Inc. in the early 70s who I've been told did put serial numbers on the Goya guitars. Kustom Electronics originated in Chanute, Kansas as did Dude Inc. Around 1977 the Goya franchise was sold by Dude to the Martin Guitar Co., who began importing Goya guitars from the orient (I have a 1977 Goya Martin Guitar catalog). 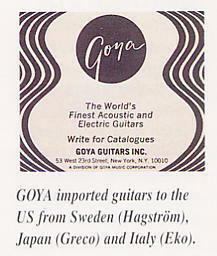 Goya was a brand applied to guitars imported into the US by Hershman. From 1959 some were made by Hagstrom in Sweden, with distinctive touches including colorful plastic finishes and multiple control layouts. By the late 1950's the influence of electric guitars had spread worldwide, evidenced by other countries' contributions to the cause, and some of these did make their mark on a pre-beat boom British market. In Sweden, accordion maker Hagstrom decided it wanted a piece of the electric guitar action and launched two- and four- pickup solidbody models in 1958. These visually arresting guitars boasted banks of pushbuttons and chromed panels plus abundant sparkle and pearloid plastic - all unsurprisingly appropriate in view of their accordion-derived ancestry. Such exercises in excess even fared well in the US where Hagstroms bore the Goya brand name. Jimi Hendrix played a psychedelic (paisley design) Goya Rangemaster, which can be seen in the "Jimi Hendrix Electric Gypsy" book by Shapiro & Glebeek. The picture in the book has this description "Goya - probably made in early 1968. This photograph (taken around March 1968 in the USA) shows Jimi playing this Italian-manufactured guitar - the first psychedelic guitar available on the market." NOTE: I believe I saw the guitarist for "Country Joe and the Fish" playing a Goya Rangemaster during a performance that was shown on "The History of Rock 'n' Roll" shown on PBS television. Stevie Nicks of Fleetwood Mac fame composed her first song "I've Loved and I've Lost" with a Goya guitar, her very first guitar, given to her by her parents on her sixteenth birthday. Asked during a MTV interview, "How long, actually, have you been composing songs?" she answered, "Since my 16th birthday, the day I got my Goya guitar. I wrote a song that day." Another great artist that used a Goya guitar in all her songs was Melanie. If you ever saw the 1967 movie "The Sound of Music" then you saw Julia Andrews playing a classical Goya guitar (I believe it was a G-13 model).Another artist associated with Goya guitars is Mason Williams, who gave us the great guitar instrumental "Classical Gas." His second guitar was a Goya which he bought in 1958. The Goya Rangemasters electric guitars were produced between 1965 - 1969. 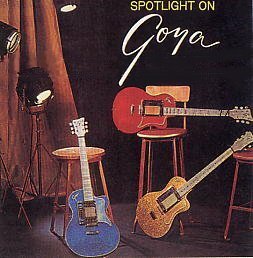 The "Goya" brand name was used at various times by Hershman Musical Instrument Company of New York, an importing firm, and as was so often the case with distribution companies one brand name turns up on guitars from a number of different sources. The Rangemaster model, for example, is of Italian origin, reflecting a 1960s predilection for multiple control layouts and most likely comes from the EKO factory. The vibrato bar, however, was provided by another Goya supplier, the Hagstrom company of Sweden." NOTE: Someone informed me that they had talked with a production manager from "EKO" in the 60s who said they had no involvement with Goya. That same person suggested to me that the "Polverini Brothers" in Italy made the Rangemaster guitars. It has also been suggested that Italian guitar maker Galanti made the Goya "Panther" models. The Goya Panther and the Galanti guitars look nearly identical. The Japanese manufacturers who started to mass produce electric guitars in the early 1960's included Fujigen Gakki which made guitars with Goya, Kent and other importer brands. Greco instruments were imported to the U.S. through Goya Guitars/Avnet. Avnet was the same major company that also acquired Guild in 1966. NOTE: The "Greco" brand guitars as owned by the Hershman Musical Instrument Company of New York (Goya Guitars Inc.) during the 1960s are NOT the same as the Japanese made GRECO guitars made in the 70s and 80s. The Hershman "Grecos" were made in various European countries and are listed in my Greco catalogs. I believe the "Greco" name comes from the 16th century painter El Greco (there were no guitars around during his days). The logo for the Hershman Grecos are in the same style as the Hershman Goya logo and different than the Japanese made GRECO guitar logos. By the way, speaking of logos, the Goya logo did go through a change sometime in the 1980s when Martin owned the Goya brand - some of these guitars were made in Korea.